Before, a newbie starts a WordPress blog it’s essential to learn its functionality so he can make use of its features pretty effortlessly. Those who purchase a Hosting and Domain for the sake of learning WordPress are wasting their money, because they can host a WordPress blog on their own personal computer without spending a single piece of penny. Nowadays we have the power of delightful software that allows a person to install WordPress or any other platform locally on his computer. Moreover, all such software is free of cost so it cannot get better than that. Therefore, it’s essential that first a person should experience WordPress locally because there is nothing to lose but lot to gain. After experiencing each and every function of WordPress, then a person is unrestricted to purchase Hosting as well as domain and can start his Dream blog. Today we will learn How to Install WordPress Blog Locally on a Personal Computer with the Help of Microsoft Platform Installer. Before, we jump onto our Tutorial let us look at the few lethal reason that why a person should experience WordPress on his personal computer. Consider the following meaningful reasons. As we have mentioned earlier, it’s totally useless to purchase a heavy-duty hosting and a domain to absorb WordPress because any person can have unchanged WordPress on their Local computer (Without spending money lavishly). Even if, a person already own a hosting then still it will be much better that he should install WordPress on his Local system because it will give him much faster experience while testing and using Themes and plugins. Before, migrating or start using WP it’s essential that a person should learn it. Installing WP locally on the computer is the best way to become a WordPress ninja without facing any hesitation whatsoever. 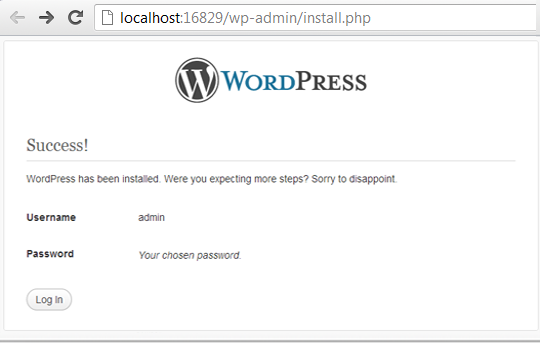 Though, it hardly takes few steps to install WordPress on the Internet. 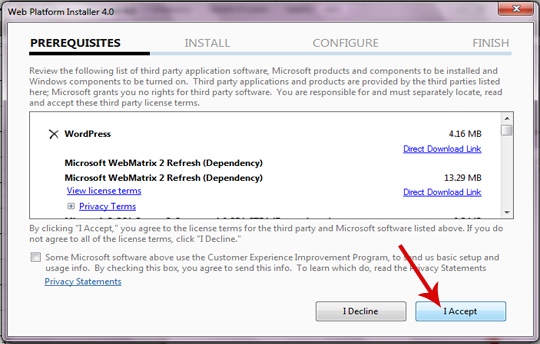 However, when it comes to install WP locally on personal PC, then this might be a tricky thing. To run WordPress on the local server a person need PHP, MYSQL. In addition, have to edit configuration files manually. Fortunately, we were able to discover a method that is as straightforward as one, two, three and done. We can use Microsoft Platform Installer, and within few clicks a person will be able to enjoy WordPress Platform without doing any complex stuff. 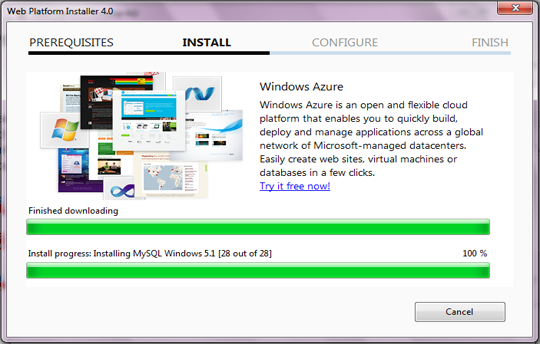 Microsoft Platform Installer is a Free Tool that allows to install multiple platforms within few clicks. In addition, it automatically selects a group of programs that are essential to run a specific platform. This program is web-based and would only download that software which is most needed. Step#2: Now open the file named i.e. 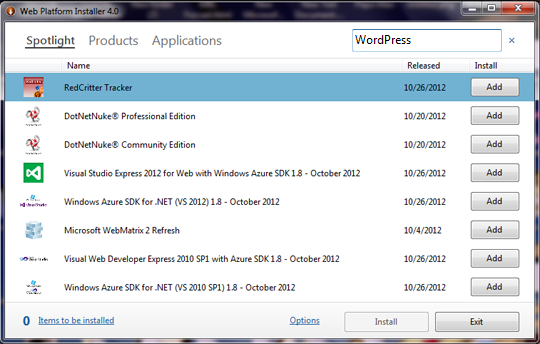 wpilauncher.exe (downloaded earlier) and a new window will pop out which will display a list of numberless platforms. Just ignore everything and in the search bar type “WordPress” then hit Enter. Step#3: Now you will be able to see two WordPress items i.e. WordPress and WordPress PT Brasil. However, you must go for “WordPress” and next to it press the “Add” button. Proceed to the next step. Step#4: Now an item is added for installation. 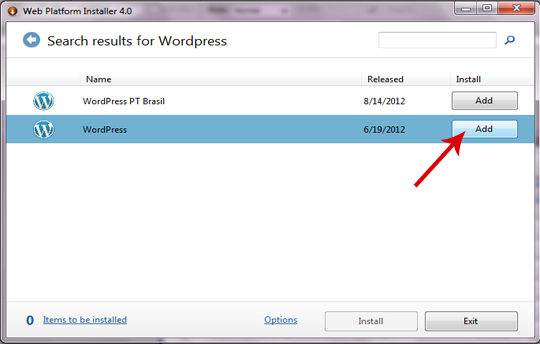 Therefore, press the Install button and we are extremely close to our own WP Local Blog. Carry on to the next step. 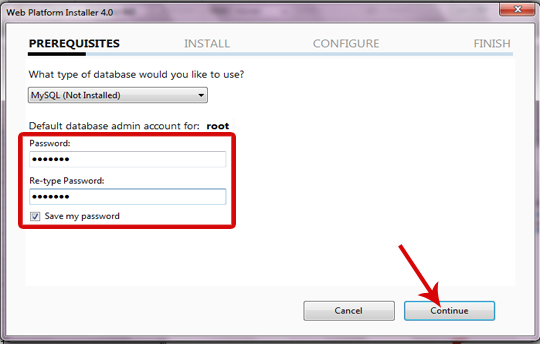 Step#5: Choose a Password of your Root Database. Since, we have installed it on our Personal computer. Therefore, selecting a weak password won’t hurt much so just typing a password and press the “Continue” button. Step#6: Since, we have select “WordPress” so it will display the list of software that are compulsory to make everything work perfectly. It will hardly take 250 Megabytes (MB) from your computer’s hard drive. Just press the “I Agree” button and proceed to the next step. Step#7: Now all we need to do is to wait till the Installation gets completed. It would take around 20 minutes. However, if you have an ultra-fast internet then it will take fairly less time. Just wait till the files gets downloaded and installed. Step#8: Finally, the installation is over. Now Scroll down and you will witness the Database Name, Password and Username. Just copy them in a notepad and press “Finish” button to move to the next step. 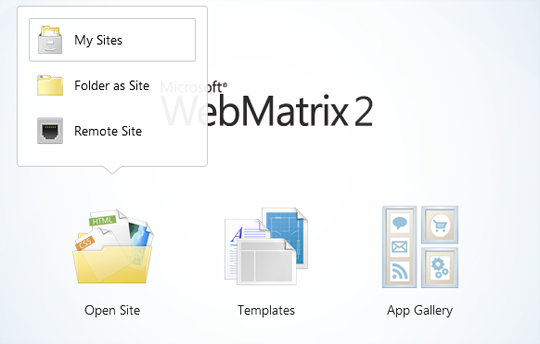 Step#9: Now automatically a program named “Microsoft WebMatrix 2” would be opened and you will be able to witness three different icons i.e. Open site, Templates and App Gallery. Just Press, Open Site >> My Site >> WordPress >> OK.
Step#10: Finally, you will be able to see a Control Panel similar to the following Screenshot. Just go to the WP URL i.e. http://localhost:16829/ (Remember: you might have different Local host URL). Now open the WordPress Local host URL in your personal favorite Web browser and, your eyes will witness that WordPress is ready to be installed. 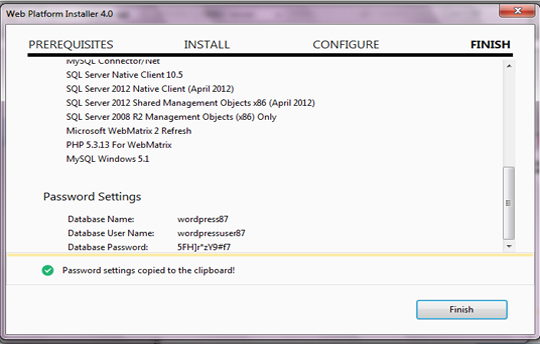 Step#11: Now all we need to do is to install WordPress. Just Follow the Following instructions. 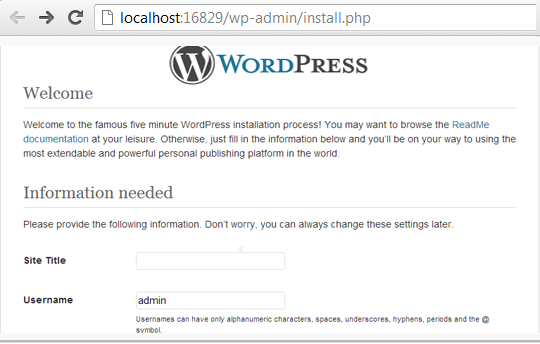 If you have installed WordPress before then, these steps won’t be too difficult. Now Type the username of admin. Then Write the same password twice. Enter your email address in case a person forgot his password it will help to recover. 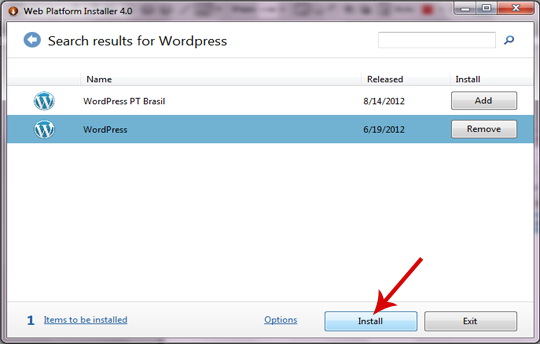 Once everything is finalized, just press the “Install WordPress” Button. All Done: That’s it WordPress is setup on your Local Computer. Now a person has the freedom to do anything with your WP blog. It has all the features that we will get on an Online WP Blog. A person can install unlimited plugins from WP Inventory. A person can do anything, anytime, anywhere. The Local WP blog will only work when you will run “Microsoft WebMatrix” so make sure it is running whenever you want to access WP Admin panel or Blog. Though, it is a pretty long tutorial. Nonetheless, it would surely help those people who are hungry to experience WordPress but don’t have enough money to buy hosting and domain. We will try our best to finish this series as soon as possible so people can take benefits from them. Take a lot care of your family till then Peace, Blessings and Happy WP learning. Excellent post. Waiting for more wp tutorials. 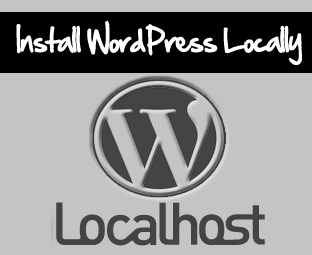 Nice and quick tutorial to install Wordpress locally. 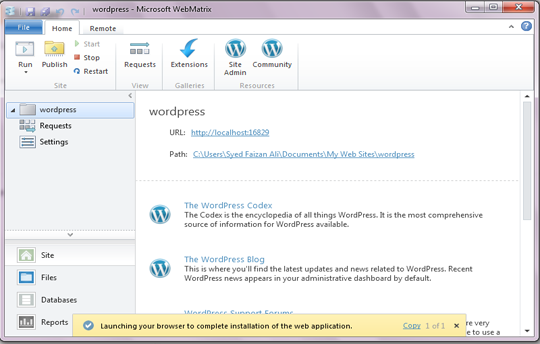 I have also installed Wordpress on my PC through XAMPP but It was complicated. Next time when I need to install, i will try by your's way and will recommend it to others. I am getting the error of this kind "sql was not downloaded it returned 404"
1)We are not paying a penny for this then why to choose the hosting over internet(ex from hostgator )? 2)Will it be same as on internet hosting? 3)What is the difference between locally hosting and internet hosting such as hostgator? 4)is it only for testing for features of wordpress only and will over site be online? Although nice tutorial and you are completing this series fast.Waiing for the next post of this series! 1. 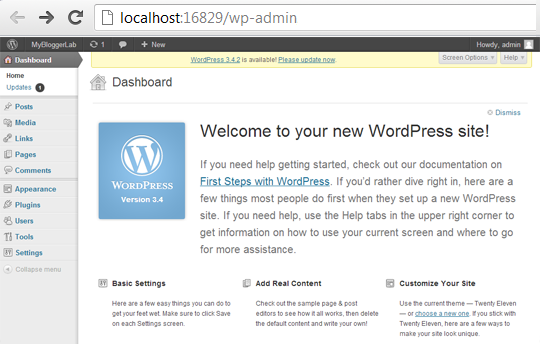 You are not paying any penny because Installing WordPress on local host doesn't publishes your site over the internet. It gets limited only on your local Internet connection i-e your Home. 2. No, it wont be same as on internet hosting. 3. Hosting WordPress on HostGator rather than Local Host allows you to publish your site/blog on over all internet. 4. Yes, it is only for testing purposes. I personally use WAMP to test my made themes or plugins for my WordPress blog. I always learn new things on it. It allows you to learn WordPress deeply! I Don't think it should give any kind or error if you are on Windows 7 or XP SP3. What is your Platform? Hi Syed! Nice Post. I just want a little help from you. As you know I am eager to get into Adsense through my website mypremiumtricks , I am glad to tell you that one of my error that Site Does Not Comply with Google Policies has been removed. But I am still not getting why it is appearining that Your website contain copyrighted material! :( I even run plagiarism checker on my websites but I still found nothing! Please help me! I Have A Question Faizan. If We Got Our Installed Wordpress Crashed Due To Any Change Made By Us Or Any Thing Else Then What To Do ? 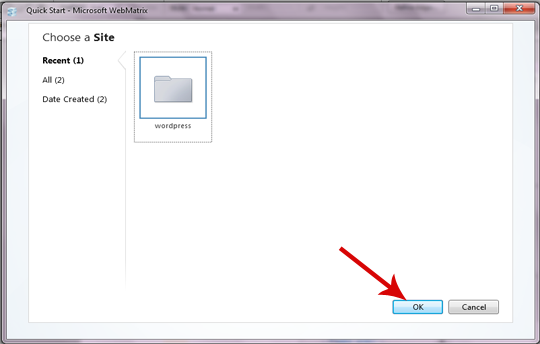 In That Case, You have to Disable or Deleted That Certain Plugin that you have installed on WP. This thing is totally rational because sometimes you are unaware of the fact that which plugin is providing problems. This is the reason why it is essential to take Backup on Daily basis. However, Some hosting services Provide an option through which you can transform your site to any date. Thanks @Raheem! Really Appreciated That you are Chipping in and playing your part for MBL. Thanks Raheem Khan and Syed, but in mine case its not working as I have xp service pack 2.
what is WAMP and how to make use of it? Nice Post , Love it . This is a nice post! I'm gonna share this out.